different sectors, as it is a good place to travel with the whole family, since it is an easy country to get around and it is quite common to visit Holland with bikes with the family and / or friends. That's why if you are not yet clear where to spend your holidays to visit the Netherlands can be a good option to discover one of the authentic northern European countries. Discover a country where part of the land is below the sea level. 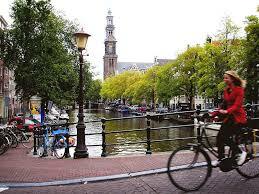 Holland Tourism is also delve into one of the European countries that culture has produced. Holland is known for its painters: Vincent van Gogh, Piet Mondiran, Rembrandt, Vermeer ... so if you go sightseeing in Holland you can not stop going to visit the Van Gogh, Rijksmuseum ... Museum among others. Although the Netherlands is not a warm country like the Mediterranean countries, traveling to Holland during the summer is a good choice, and though not particularly warm one can go in short sleeves during those months. Still, take advantage of the winter to go sightseeing in the Netherlands is not wasted as they wander among the beautiful streets of Amsterdam hung snow is a fantastic experience. Also worth mentioning Navideños Markets taking place in several cities in the Netherlands. So, if you plan on going on a trip to Holland do not worry about the weather, and you could enjoy its landscape during all months of the year.